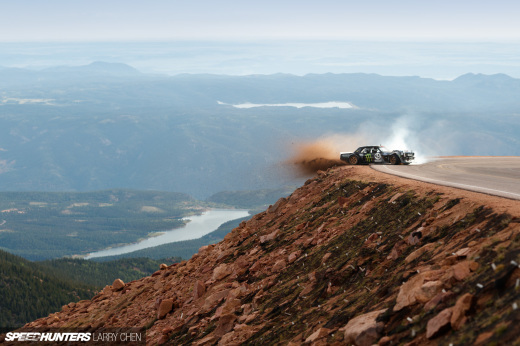 Ken Block’s Gymkhana has exploded onto the global scene, taking a form of competition that was previously something more associated with gentle Sunday afternoon auto-testing and throwing in racing technology, a ton of power and the full force of an automotive apocalypse. 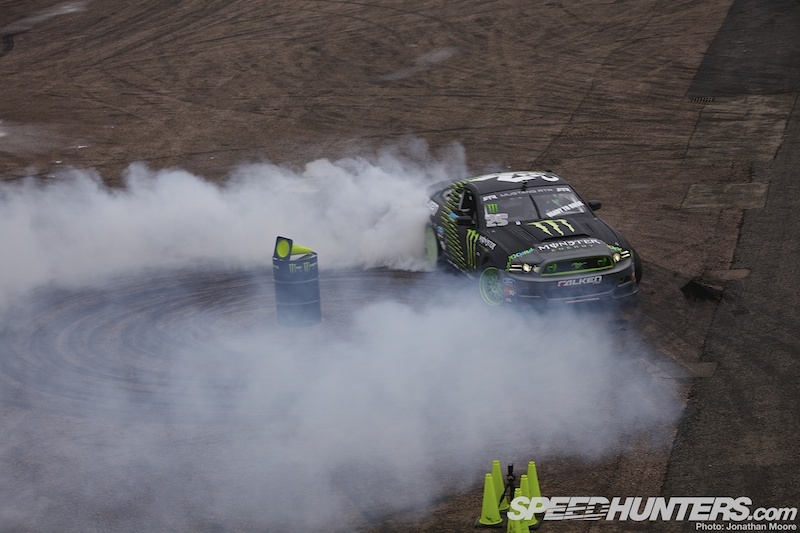 Across four events around Europe, competitors have taken on the Gymkhana course against the clock and their rivals in order to secure a place in the finals. 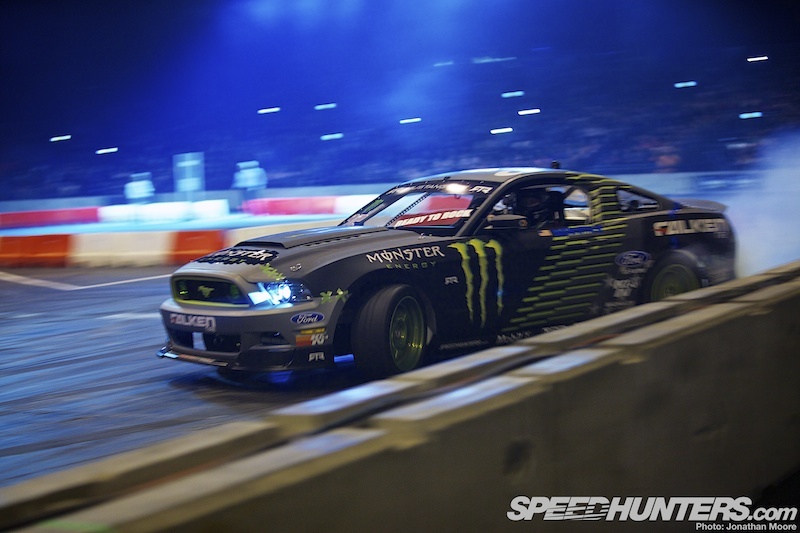 Starting off in Clermont-Ferrand in France, the Gymkhana qualifying tour then took in Trax at Silverstone, Oschersleben’s Sport1 Trackday in Germany and then the AutoMaxx Super Sunday at Zandvoort in the Netherlands, building up to the finals to be held at the Santa Pod drag strip in the UK. 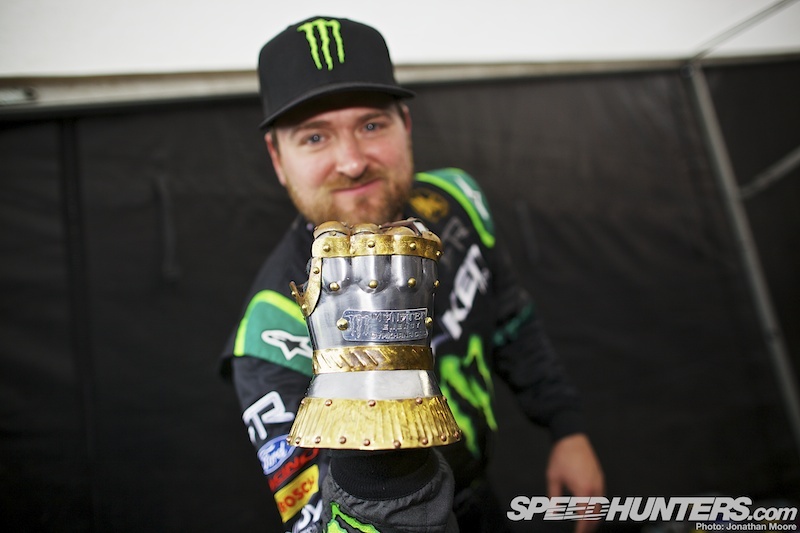 Block didn’t come alone to the finals: to help out with the hooning he enlisted the help of Formula D buddy Vaughn Gittin Jr.
Vaughn shipped an RTR Mustang over to Europe especially for the event, bringing a loud dose of smoking V8 power to the rear-wheel drive portion of the proceedings. 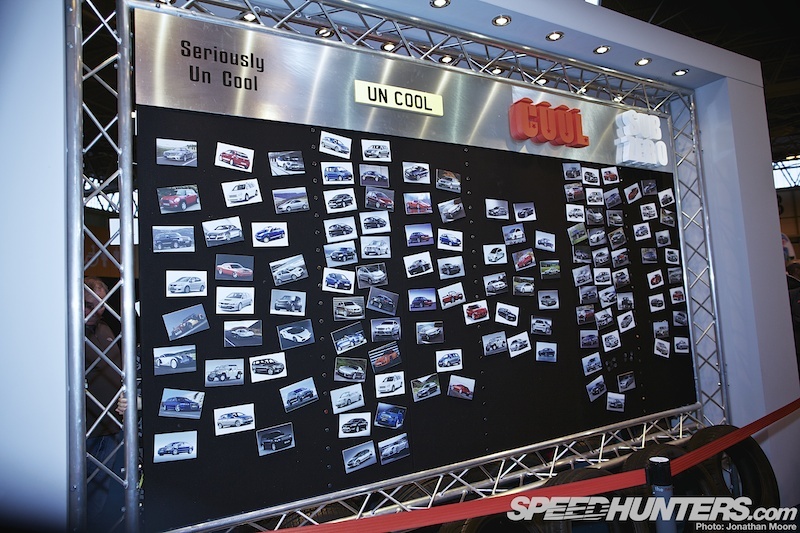 …which Ken would face off against in his own Fiesta RS rally car in the All-Wheel Drive class. But before all the hooning for the weekend got underway there was the matter of a little diversion to the west of Santa Pod. 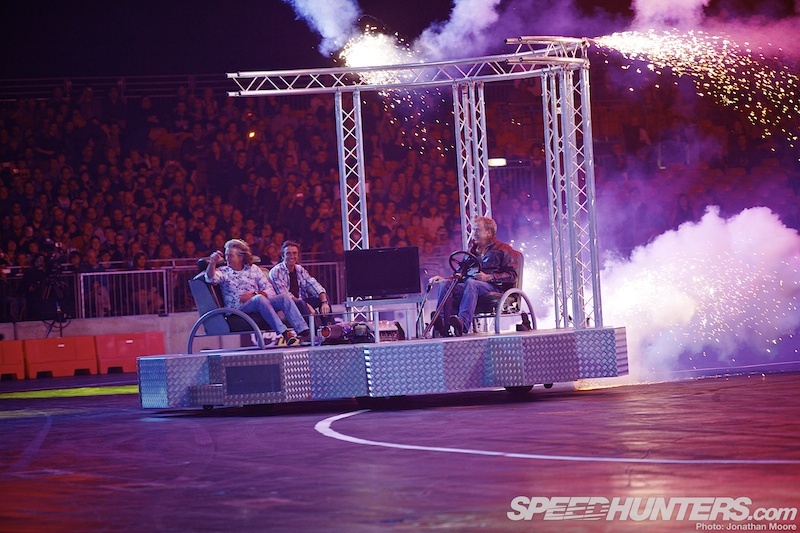 Ken and Vaughn had been booked as special guests at Top Gear Live, to be held in the cavernous halls of the Birmingham National Exhibition Centre. 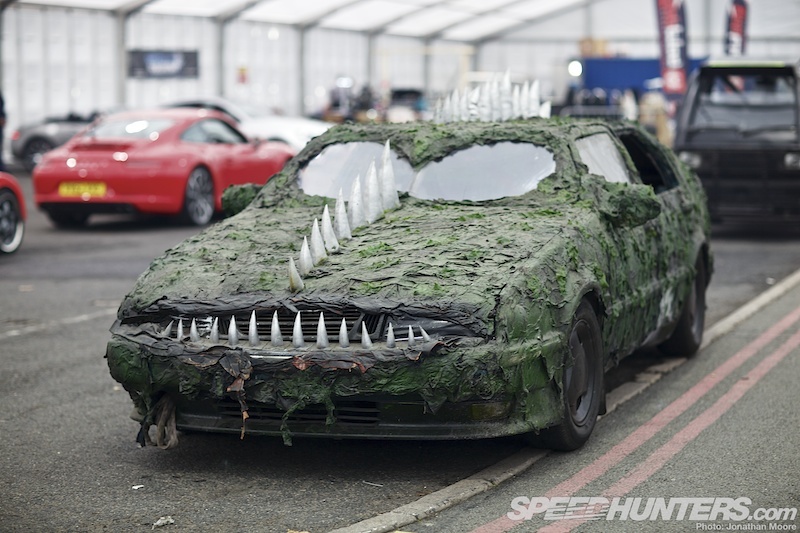 Top Gear Live took over three halls, with the main area showing off props from the show and a big collection of exotica from both the road and racing worlds. 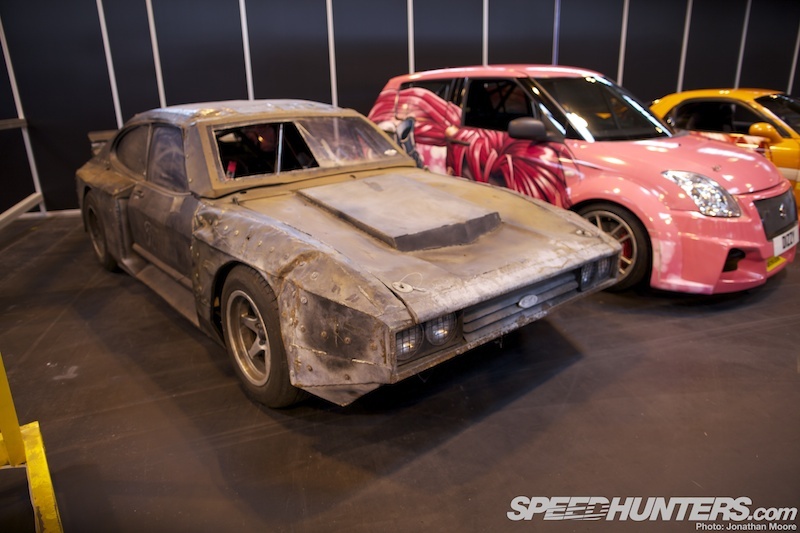 …and an apocalyptic Capri, looking like Zakspeed had joined forces with Wacky Races and a Panzer division. 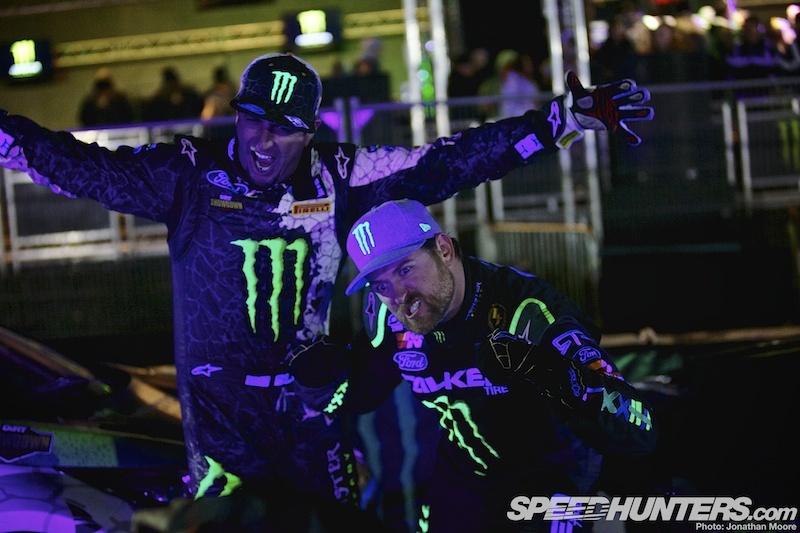 Ken and Vaughn would be putting in guest appearances in their Fiesta rally-car and Mustang drift machine respectively during the two shows in the Live Action Arena on the opening Thursday of the four-day event. Predictably, media attention around the pair was pretty constant. 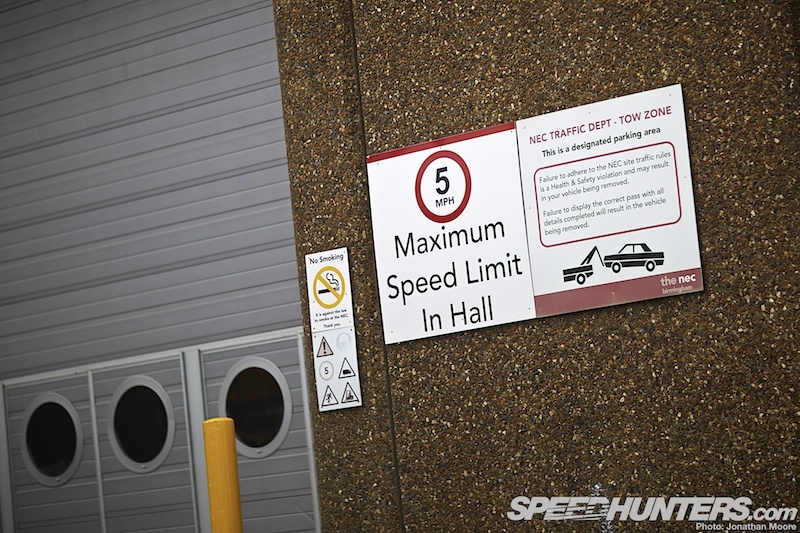 Both drivers had a single run each of just a couple of minutes duration during each live show, and several dozen cars lined up to take part in each session. 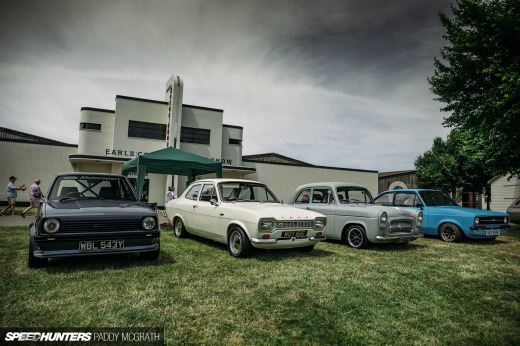 That meant there was plenty of time to stroll around the back-stage paddock and take a look at the other metal on show whilst waiting for their turns. There was a ridiculous number of supercars parked up, which would be taking part in a piece of choreographed mass exotica early in the show. 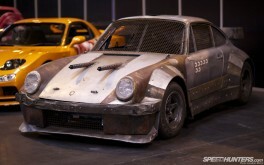 Needless to say these beauties weren’t thrashed like the majority of cars in the arena! Particularly eye-catching was this ultra-rare Mercedes-Benz CLK GTR Roadster: it’s the only right-hand drive example of just six Roadsters built by M-B around 2006, using the leftovers from the canned Le Mans GT1 programme from 1999. Homologation rules had meant they nevertheless had to complete the promised 25-car production run, and this is one of the results. These are still fearsome machines, producing well over 600hp from the 6.9-litre turbocharged shallow-angle V12. Where there’s silver, there’s gold: like this fully bling-tastic, wrapped GT-R.
Next to the pristine supercars were the Top Gear stunt vehicles: mangled wrecks of cars transmogrified and bent to the will of the twisted Top Gear crew for this year’s shows. 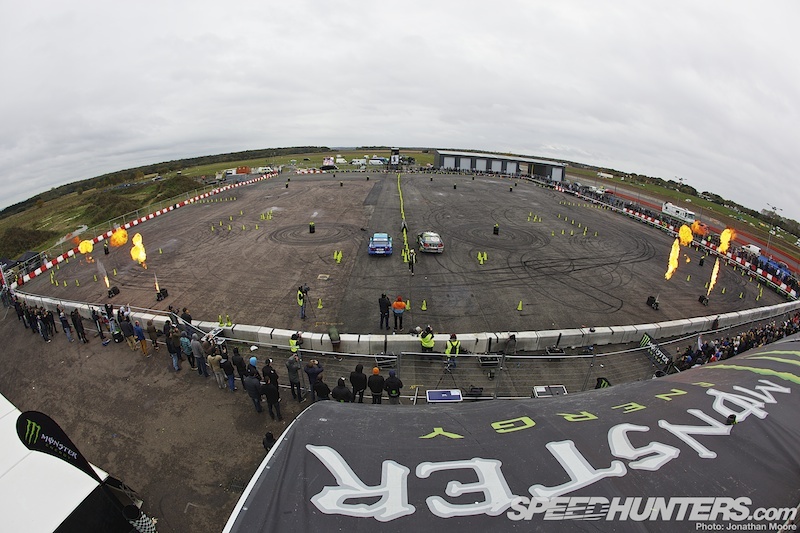 An army of stunt drivers shuttled between vehicles, taking one set out for their automotive torture session before racing back in to jump into the next batch. 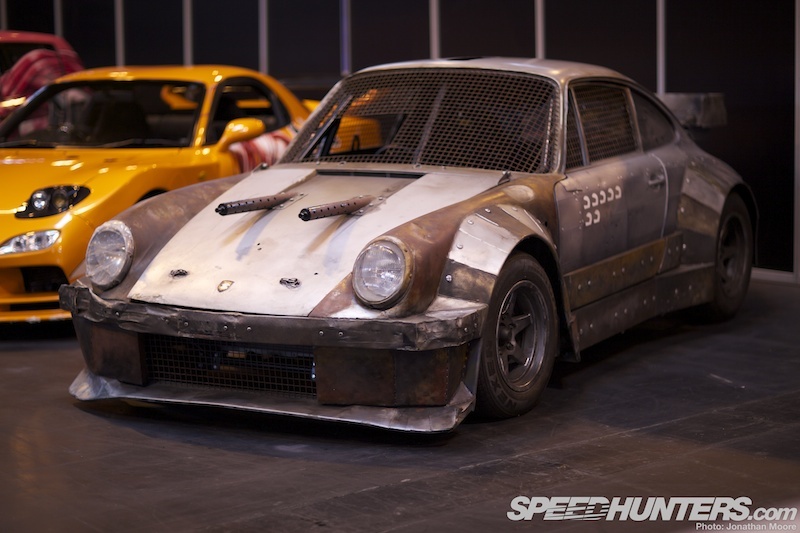 You want a pair of 911s on fire, autocross against snipers or a game of skittles using hatchbacks? 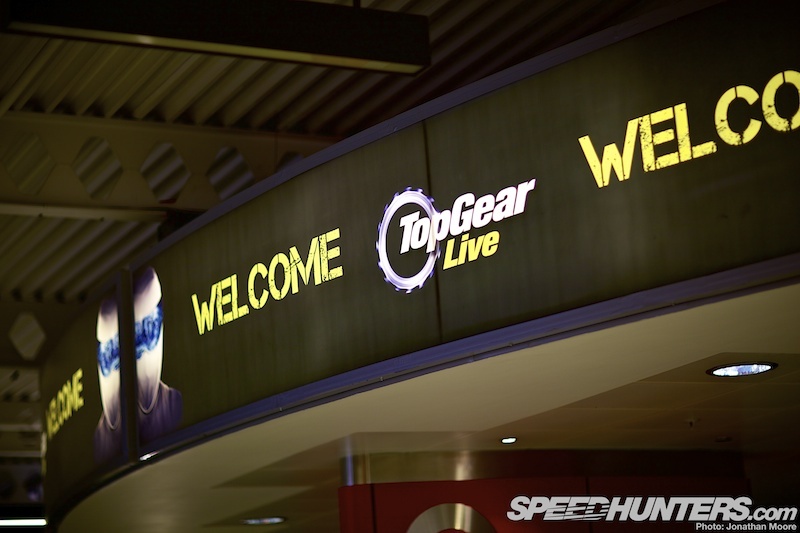 Then Top Gear Live is the place to be! 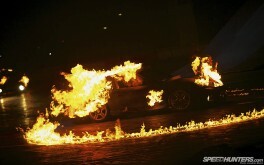 Powering all the mayhem was the backstage special effects crew, who put in a huge effort to keep the spectacle in full flame-throwing, handbrake-pulling top gear. Ahem. 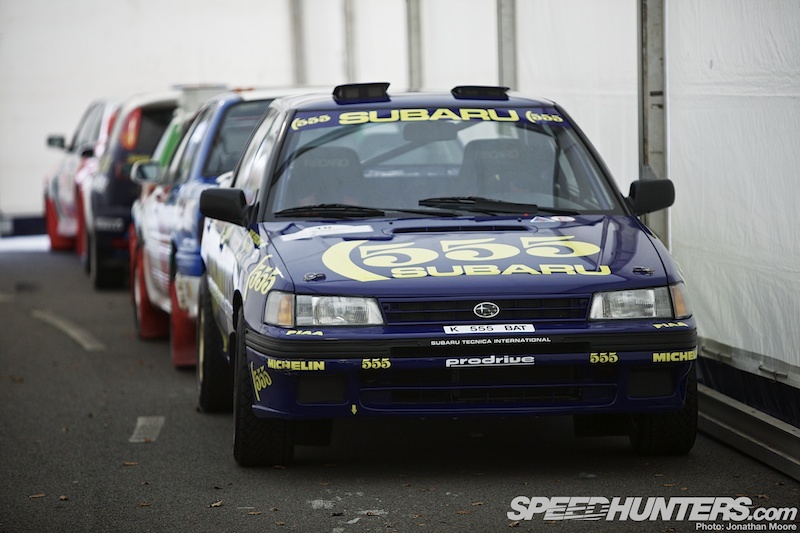 Rallying was due to be celebrated during the live shows, and over half a dozen iconic examples of Subarus, Fords, Mitsubishis and Toyotas were lined up and ready to go. 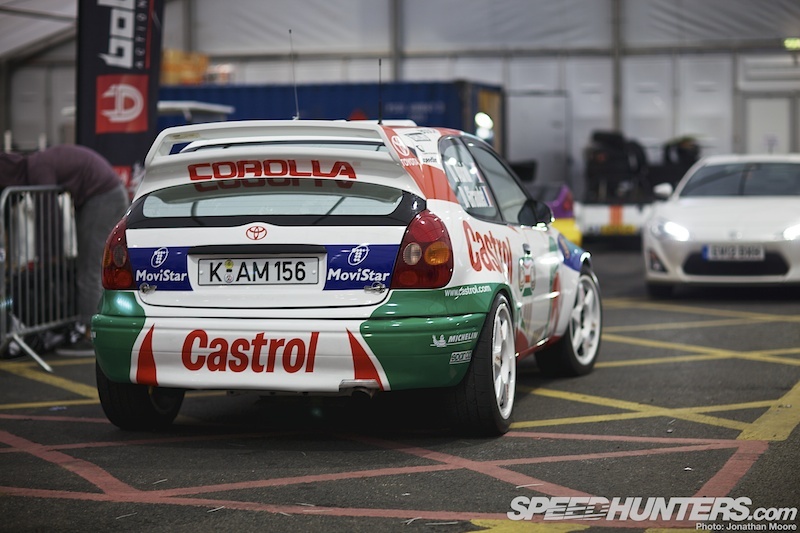 …though a Castrol livery combined with a Toyota hits the spot every time. …and the next a car would suddenly appear below him. Strange. 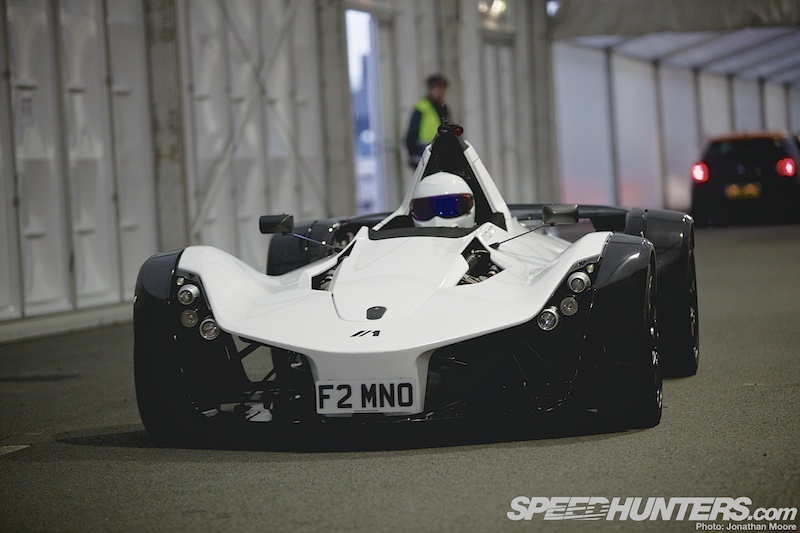 As well as taking on a trio of army snipers whilst he autocrossed the new Caterham Superlight R500, he also ran out the new BAC Mono, which is being raved about by reviewers that include our own Bryn Musselwhite. Every so often Vaughn and anyone else handy would push the car forward a couple of car-lengths as the queue in front gradually shortened with each on-track segment. 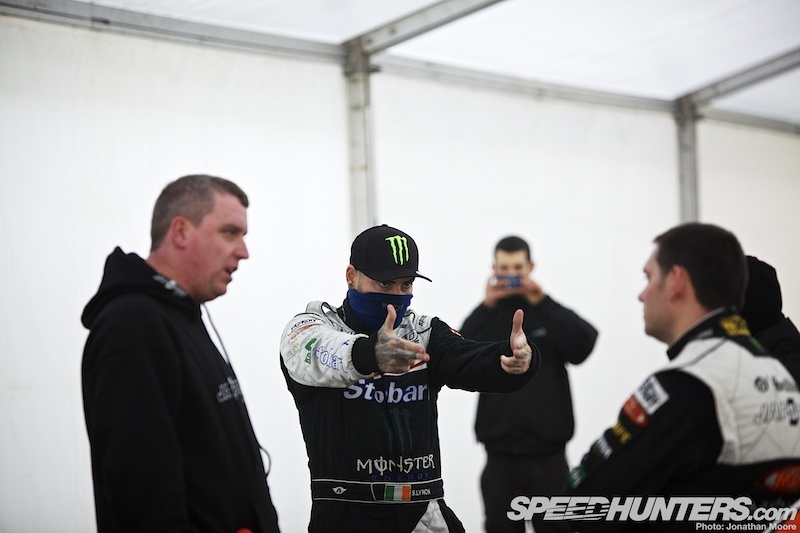 Team Japspeed from the British Drift Championship were due to put in a drift demo straight after Vaughn: Shanes Lynch and O’Sullivan would be facing off against each other in the arena, with Shane Lynch already getting in combatitive mood. 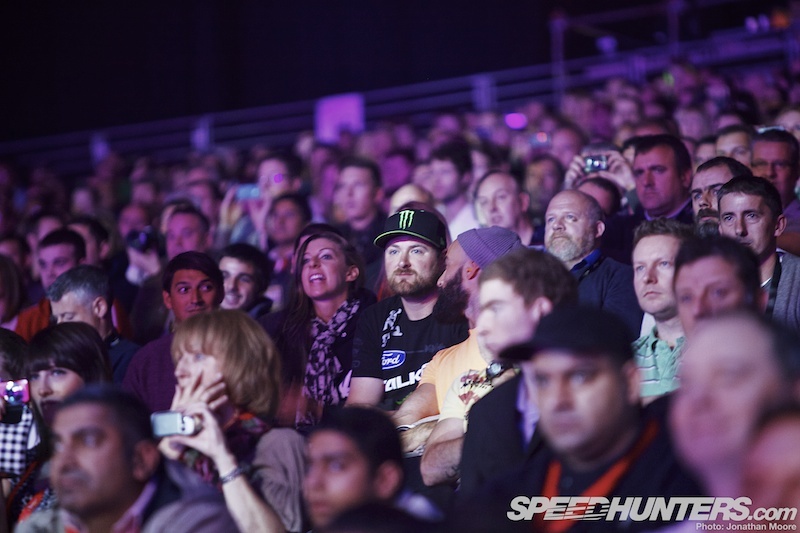 …Vaughn headed into the arena to watch the opening act of the afternoon show. 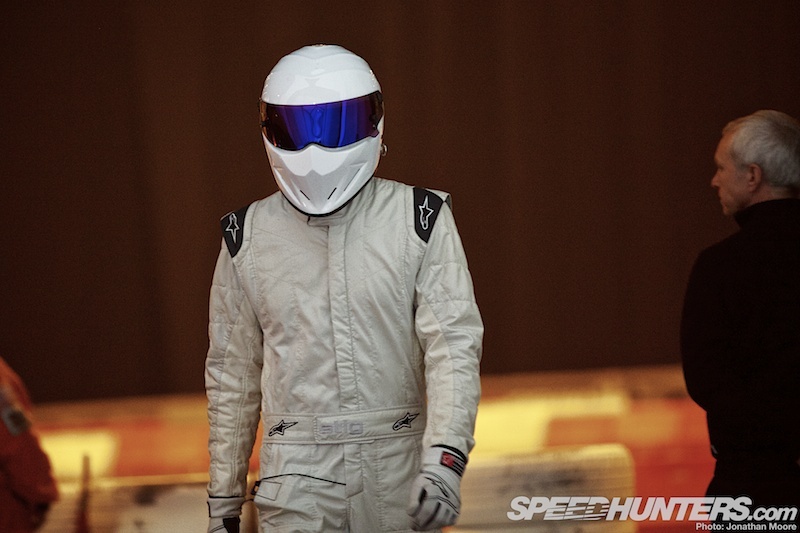 Nothing about the Top Gear Live show is subtle or grown-up. There’s no attempt by Clarkson, Hammond or May to keep the tone high-brow. 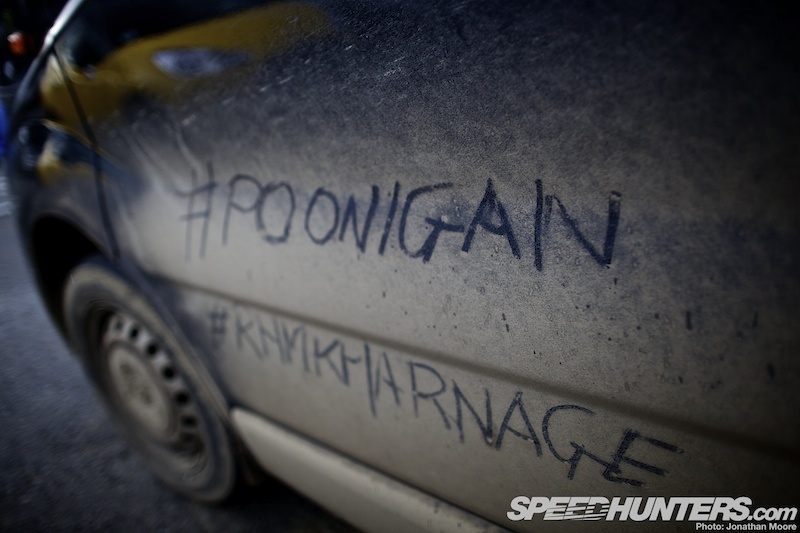 After all, this is Top Gear! 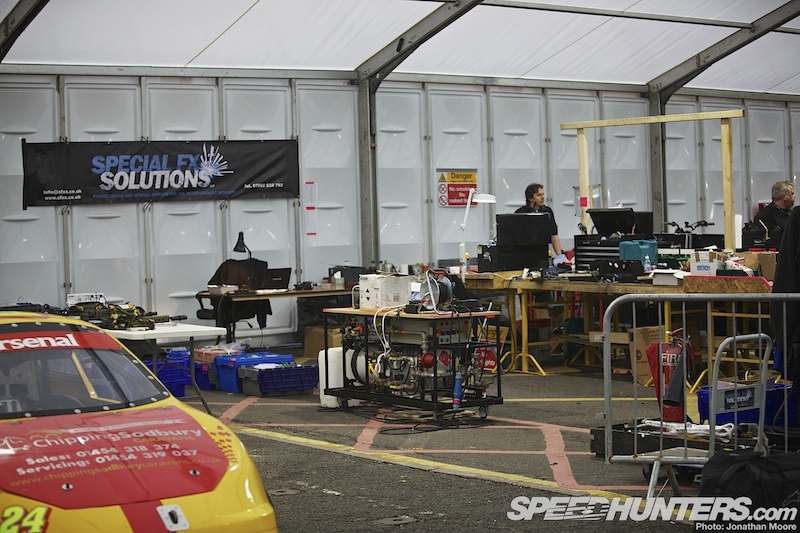 The team arrived at full pelt on their V8-powered studio set, before demonstrating that it is possible to donut a stage! 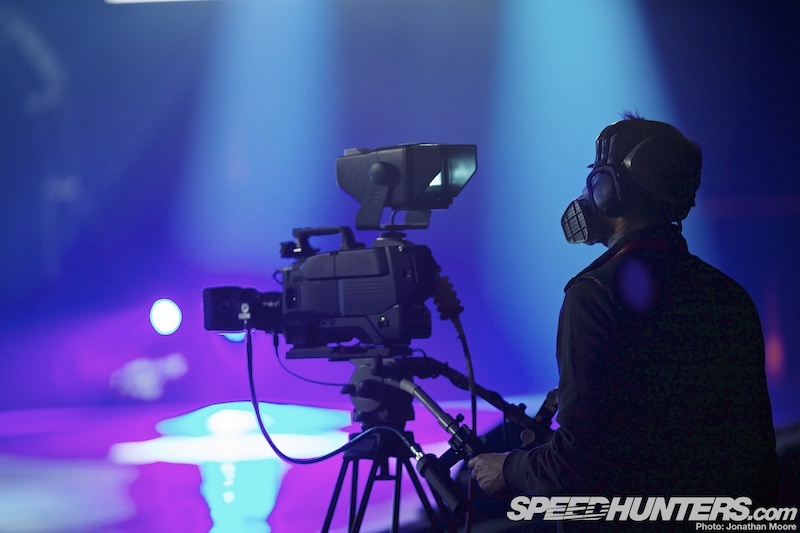 Cameramen lined the side of the arena, all equipped with gas-masks to protect them against the pall of smoke that hung in the air. 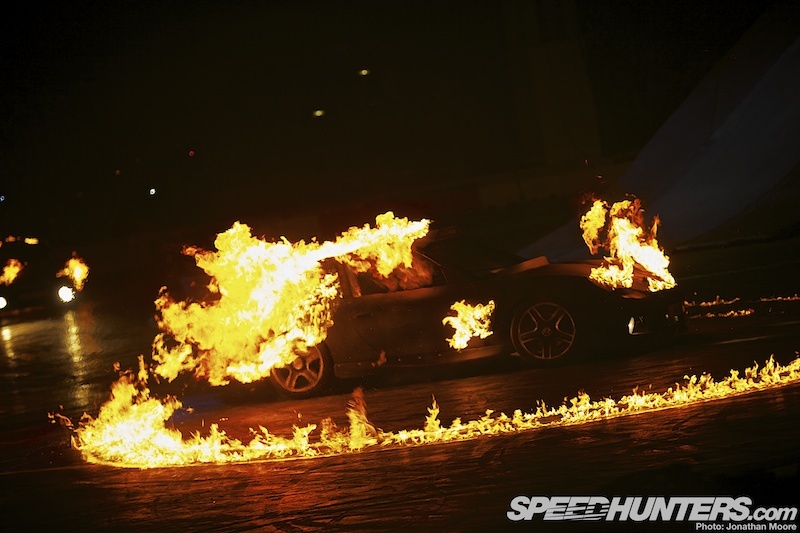 …going on fire on four wheels. 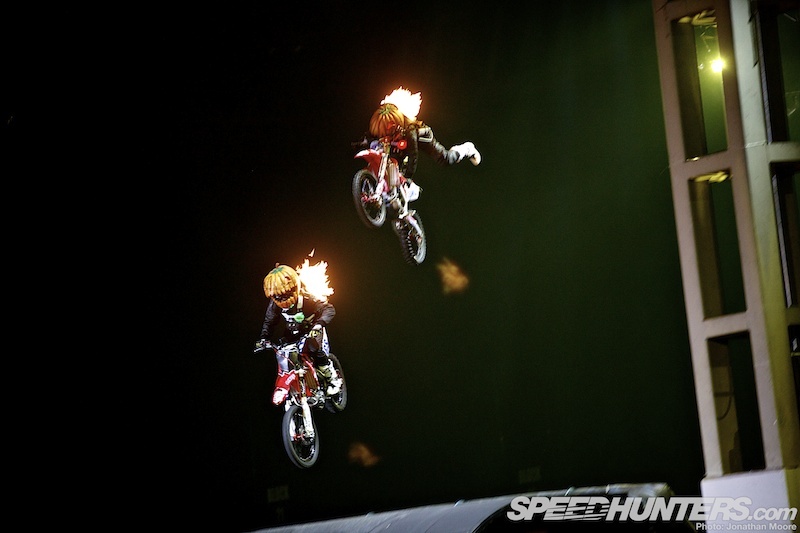 …going on fire on two wheels. …and going on fire on two feet. 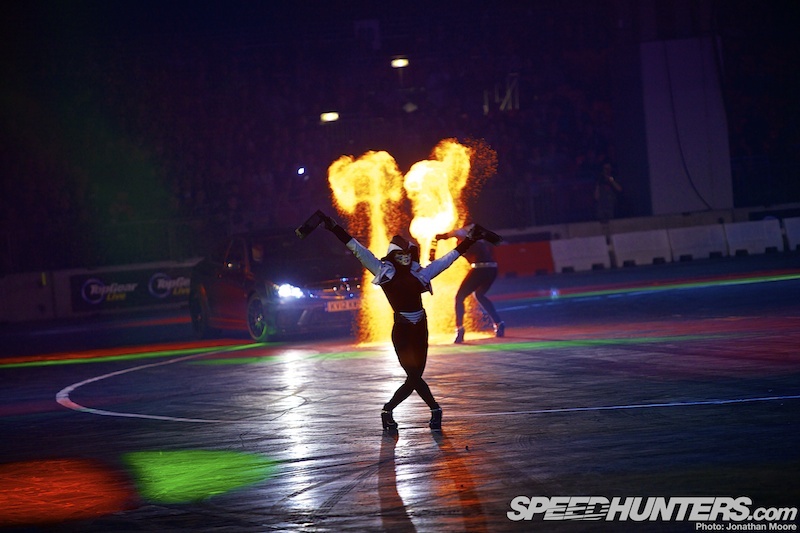 Generally, the long and short of it is that Top Gear Live is about setting things on fire. 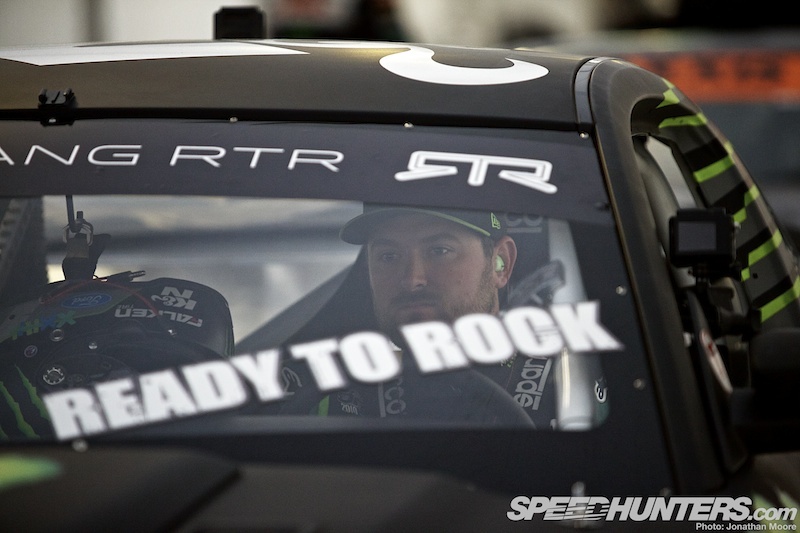 With his slot coming up, Vaughn made his way back to the RTR and started to warm the Mustang up. 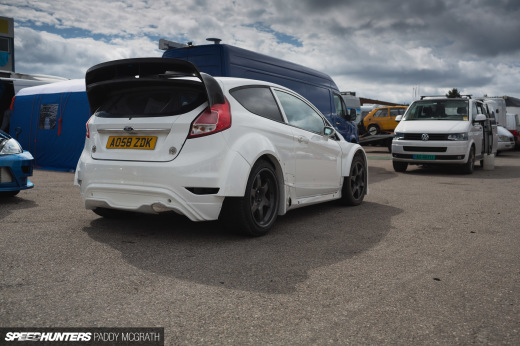 By far the loudest car on show, the Mustang sounded like a nuclear bomb in the confines of the tented paddock. 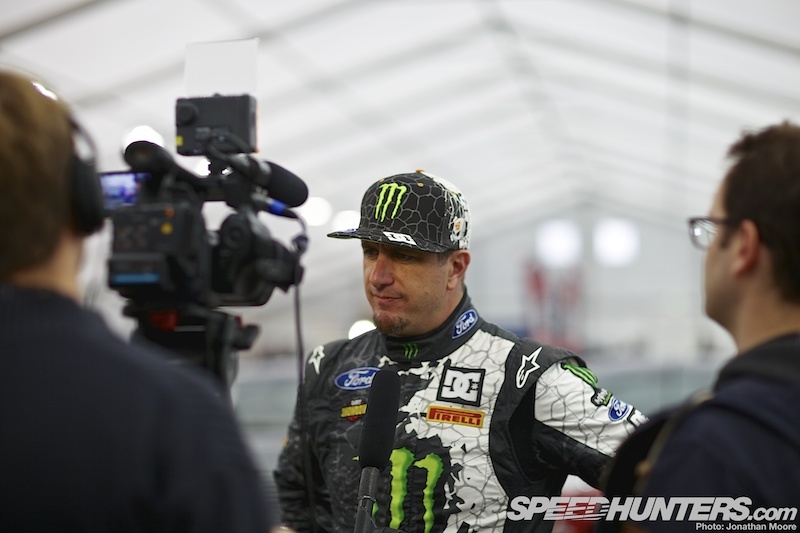 Ken Block had just walked past, fresh from finishing his last run of the day, as Vaughn was pushed to the head of the queue. Then in a flash he was off and round the corner for his first turn around the packed arena. 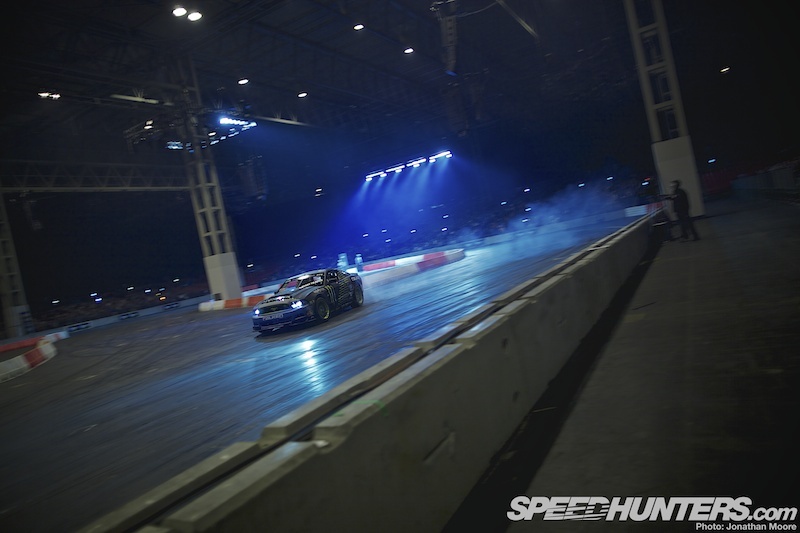 Despite the surface being pretty slippery and the entire arena being lined with concrete blocks, Vaughn still hung the rear out all the way round, smoke pouring off the rear tyres. The crowd loved it of course, though it was over far too quickly and all too soon Vaughn peeled off back into the paddock. …before Shane Lynch was handed a very biased win by co-presenter Vicki Butler-Henderson! 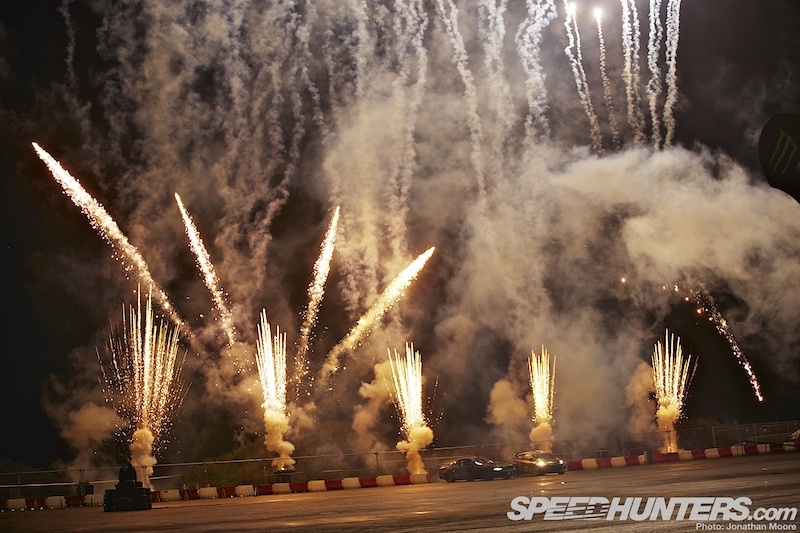 For Vaughn and the crew it was time to pack up and head over to Santa Pod: two days of tyre-smoking fun awaited – which is where we’ll be heading next. Damn I wish we had something like this in the US. Great article! 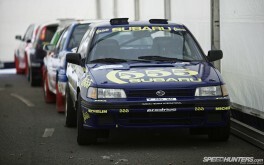 Really looking forward to your feature on Gymkhana Grid. 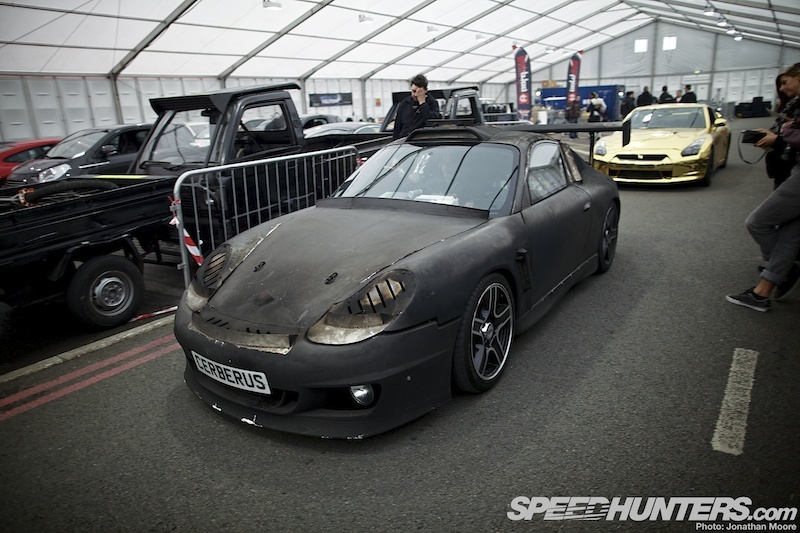 I was at Santa Pod and armed with my camera, but was unable to get any decent shots though the fence! @EthanGuzzi @FunctionFirst they do have a few shows!! 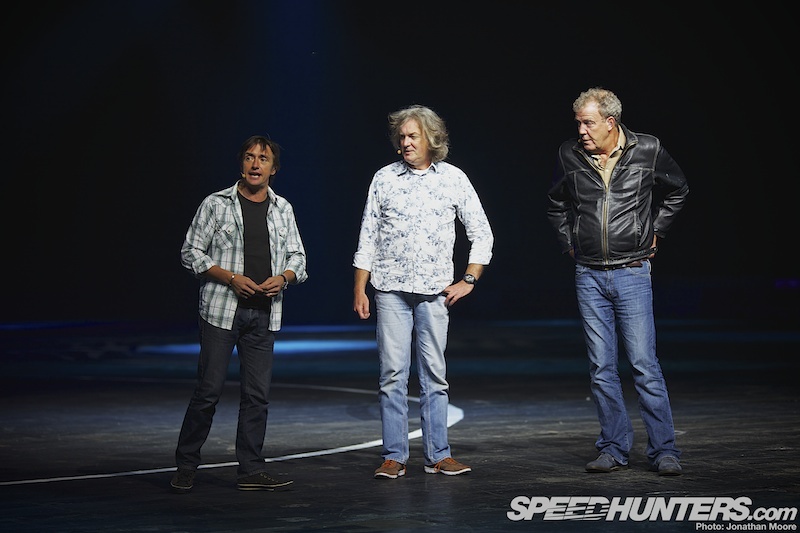 its the top gear live tour, they go to different places around the world...might have to wait till next year for the new dates and locations though...! kinda gutted that i didnt go this one though, considering i live like 20 mins away!! 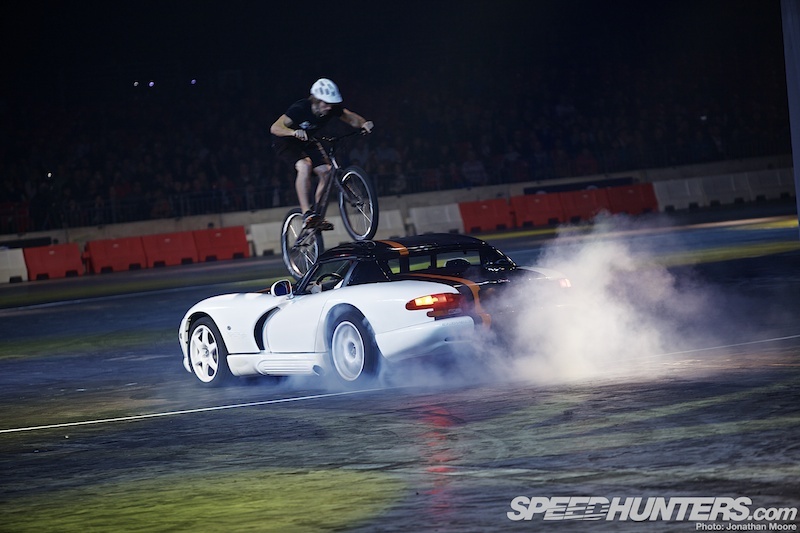 @EthanGuzzi @FunctionFirst They did Top Gear Live in Perth, Australia last year! Dow you know name of Helmet white please ?Connaissez-vous le nom du casque en blanc ? Watched the show at N.E.C in birmingham it was brilliant!! 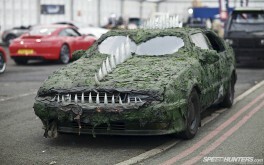 @StephenEarley Yes, this is definitely a car I want to follow up on. It's an incredible machine!